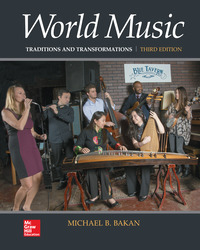 Move to the rhythm of music and culture from around the globe, presented to you in the third edition of World Music: Traditions and Transformations. Students will thrill to participate in an exciting global journey of musical and cultural discovery, exploration, and experience. This text appeals to both music majors and non-majors alike by approaching the world of music in a multi-dimensional way, highlighting the connections between music and its rich cultural contexts.